At Webheadz Media we print locally high volumes of posters for many of the local events and businesses around the island so were sure you have seen our work before. Everything from Black Printing on Normal Paper & Fluro Paper to Full Color Printing on Gloss Art Paper for that professional finish. Our prices are the cheapest on the island but that does not mean our quality is low, we print everything on a High Quality Laser Printer and use tried and tested paper stock for long lasting designs in the Thai sun. Looking to print your next brochure or marketing material, we have competitive rates for high quality printing through our Bangkok Printers. We offer a digital offset printing service that features fast turnaround, high print quality, and levels of customization previously not economically or technically viable with traditional lithographic offset. We print brochures, books, magazines, and packaging on all types of paper stock and with a complete range of finishes. Our specialty is bulk offset printing and shipment overseas, we compete on both quality and price utilizing state-of-the-art presses from Heidelberg and Ryobi, along with experienced operators both in the pressroom and pre-press. Our large format facilities print indoor and outdoor poster and sign graphics, banner displays, pop-ups, backdrops, fine art prints, retractable displays, exhibition booths and billboards. At Webheadz Media we believe in a quick turn around time for all our customers and understand the meaning of deadlines. You will not only receive your product in a timely manner, but our quality and customer service is the best in the business. Our knowledge of print processes and materials enhance the effectiveness of layouts and an efficient final production. Most of our work is done on site to ensure that you receive a superior quality result at competitive rates. We print high quality digital Business and Name Cards on the island. Short runs of 200 card upwards available on Gloss or Matt Card supplied in plastic card boxes for that quality finish. We also print Cheap Black on white or color card include fluro colors available on request. 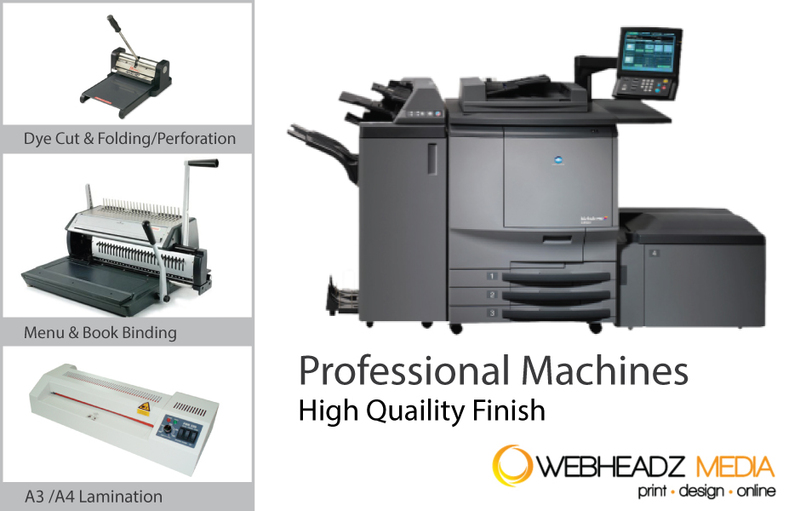 Printing Flyer on Our Professional Digital Printers are good for short runs and quick turn around times. Min runs are low from 100 to 200 piece depending on the size. Offset Poster Printing is a more cost effective way to printing large amounts of Posters and at sizes we don’t do here on the island. This is a cost effective way of getting more for your money than normal digital printing. You can make big savings when you print 1,000 piece upwards with Offset Printing through our partners. Contact us today for a quick quote to see the savings you could be making by printing smart. We print A4 & A3 high quality poster direct from out office. Quick turn around times and great prints on high quality paper that wont fade in the Thai sun or run in the rain. Please Note: All Digital printing is done on a Fuji Xerox Digital Printer and the Flyers/Brouchers are cut and folded to a professional standard . Turn Around time is around 2-3 days depending on amounts and folding. Black Printing on Color/Fluro Paper Available on request.